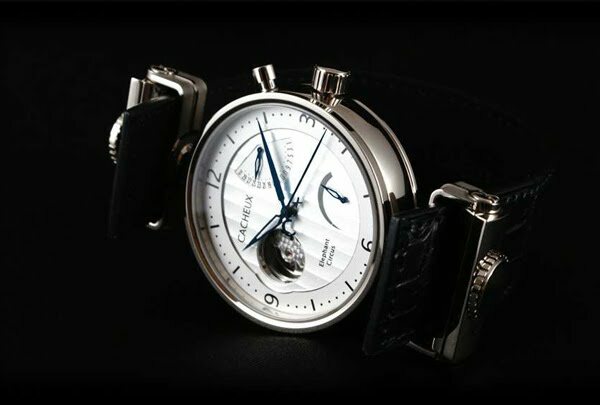 Having seen it's success, in the international media, the initial project of the CACHEUX Haute-Horlogerie brand was to produce this concept watch. The Circus version complete the Elephant collection, composed of this Circus and the Elephant Tourbillon. The cases are made from blanks of 18 carat gold : the body, bezel, back, brackets, crown, buttons and screws, 135 grammes of gold are needed to bring the Elephant Collection all of its beauty. The cases are completely polished, and the brackets are polished and sanded. The double brackets which operate as bracelet clasps give to this collection and specifically to the Circus version a strong personality. It is simple and pleasing to loosen the bracket button with a quater turn, sliding the bracelet through the bracket before refastening, you simply have to pull the bracelet down to lock the button, and the watch is safe on your wrist! Each bracelet is created specifically for its owner, so that the watch is ajusted to their wrist. This work of art has required specific tools to be created (for example a special brush to polish between the bracket and the case) in order to obtain high precision pieces with a perfect finish and the pieces were polished at different stages of production for a better finish. The heart of the Elephant Circus allows it to run for an incredibly long time, lasting longer than the Elephant Automatic (72 hours) and the Elephant Tourbillon (34 hours). The Circus has a double barrel which gives it a power reserve guaranteed for at least five days (tests have shown it to last for over six). The power reserve is shown on the dial at the 5 o'clock position. The retro-style date can be set using a push button at the 2 o'clock position. 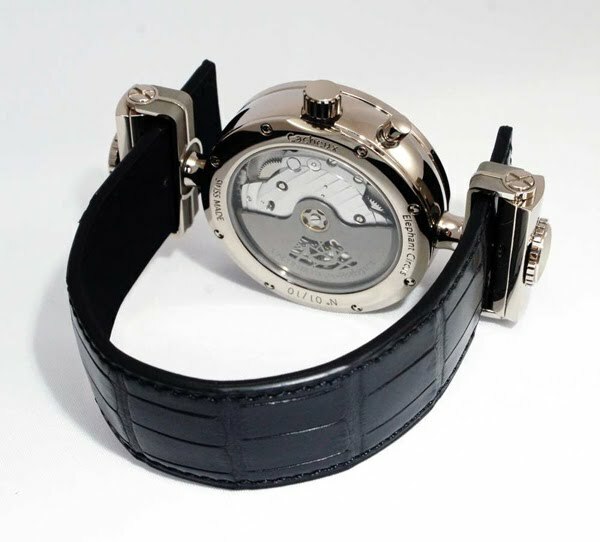 Finally, note that the movement has a pearled-platinum balance at the 9 o'clock position. The movement is visible through a sapphire watch glass on the back of the case, allowing you to admire the double barrelled movement, a drawing like the arteries feeding the heart of the watch, forming the rotor. The Elephant Circus is delivered in its black wooden Gonzago Alvez case worthy of the Elephant (20cm x 20cm x 15cm, with wood specifically chosen from sustainable sources), the interior of the case is in black leather, with a drawer for the documentation and the Cacheux microfibre cleaning cloth. The Elephant Circus is also delivered with a bottle of Perinet-Cacheux special Cuvée Champagne, in a case in the colours of the CACHEUX Haute-Horlogerie brand. The Elephant Circus is guaranteed for two years, under the condition that it has been serviced at least once within these two years in one of our workshops.